Marks & Spencer Ireland Vouchers, Discount offers and Free Gifts in April 2019. Redeem a Marks & Spencer Ireland Voucher from voucher-code.ie and get your benefit at marksandspencer.ie. You will receive a €10 voucher when you sign up to the newsletter at Marks & Spencer Ireland. The Marks & Spencer Ireland Voucher can be redeemed with a €50 minimum order value. Never miss again a Marks & Spencer Ireland voucher or sale offer! Please enter a Marks & Spencer ireland voucher code directly in the 'Enter Promotion Code' box on the shopping basket page and activate encashment by hitting the "Apply" Button. Promotional Code is case sensitive, use uppercase and lowercase letters where necessary. Discounts will be applied only if the code is valid and meets the minimum value required. Marks & Spencer is one of the UK’s leading retailers selling stylish, high quality, great value clothing and home products. Marks & Spencer is online in Ireland since 2012. 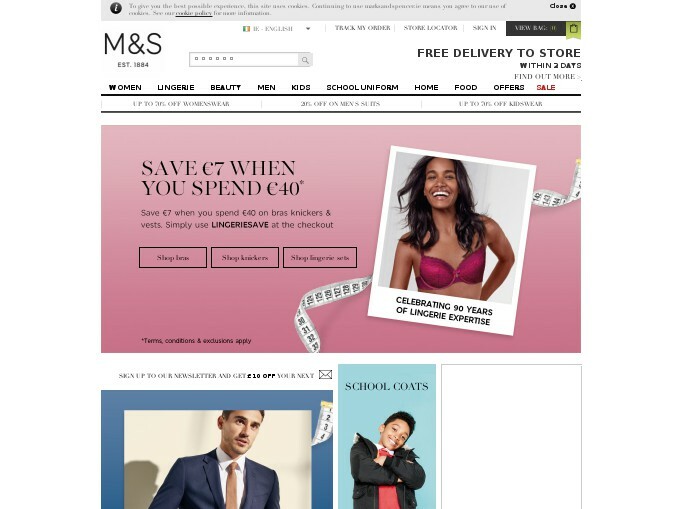 The website now offers a full catalogue of Marks & Spencer products including the biggest range online for Womenswear, Lingerie, Menswear, Kidswear and Homeware.